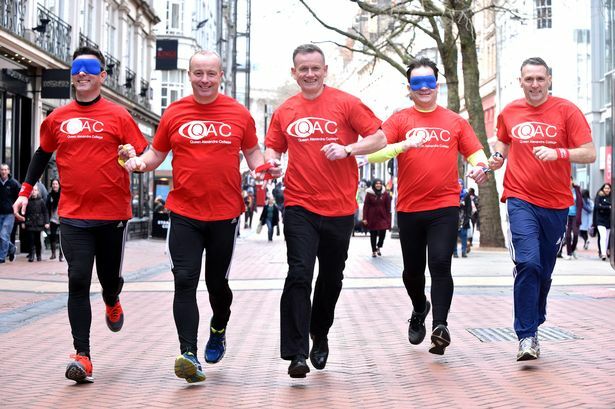 Two city centre hotel managers will find out what it’s like to be in local legend ‘Blind Dave’ Heeley’s trainers – by tackling the Great Birmingham 10k blindfolded. MacDonald Burlington Hotel’s regional managing director Derek McDonough and hotel manager James Bee will forgo their sight and rely on instructions from guides while running alongside the fundraising hero on Bank Holiday Sunday, May 1. West Bromwich-born Dave’s record-breaking endurance feats have inspired Derek and James to raise funds for Queen Alexandra College (QAC) – a specialist, national college which provides education for young people with disabilities including being blind and visually impaired. The pair will be part of the 15-strong Team QAC running the 10k, with all funds raised supporting students’ educational needs. Dave is a governor at QAC, in Harborne, where he studied for three years. The father-of-three, who was diagnosed with retinitis pigmentosa and told he was going blind at just ten years-old, has earned national acclaim after becoming the first blind person to complete the seven-marathon challenge in 2008 and raising a staggering £3 million for charity. “The hardest part for Derek and James will be the training,” said 58-year-old Dave, who has completed other gruelling fitness challenges for charity. James said: “We are really pleased to be raising funds for those with disabilities in Birmingham and across the UK. Team QAC will be aiming to defend their title as they enter the Great Birmingham 10k’s Business Challenge for the second year running. Having won the ‘large organisation, mixed’ category in 2015, they are entering three teams this time round. Sarah Caldwell, QAC fundraising and grants manager, said: “Derek and James will experience for a short while what it is like for Dave and other blind people to do something we normally take for granted and we really appreciate what they’re doing for our students. “Events like the 10k are about raising awareness as well as funds for our cause. “We have a mix of abilities representing Team QAC, including experienced runners, some who are in training and others who are completely new to it. There is less than a month to before the Great Birmingham 10k, but you are not to late to enter. More than 7,000 people are expected to take part. This year’s event has music at its heart with special warm up and starting waves for fans of either 70s, 80s, 90s or 00s music. City legends UB40 have been unveiled as honorary starters.